If the legislature can find the political will to fund elevated rail, it can find the funds to elevate our schools. As Donald Trump starts to roll back the Environmental Protection Agency and its work, Hawaii has to step up to protect its own fragile ecosystem. Ban sunscreen with oxybenzone to protect our reefs, polystyrene to protect our oceans, and chlorpyrifos to protect our keiki. Require full disclosure of all toxic chemicals being brought into Hawaii. Absolutely restrict chemical spraying near schools and other vulnerable populations. Kim Coco is uniquely qualified to be addressing Homelessness in Hawaii, as she is the only LG candidate who has been involved with addressing homelessness on the front lines since 2001. 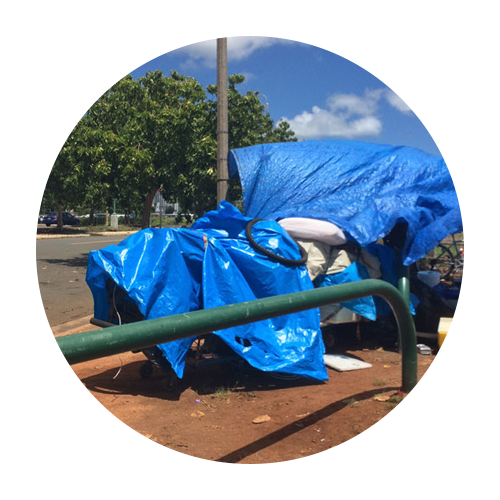 Kim Coco was the Homeless Outreach Coordinator and then the Managing Attorney of Volunteer Legal Services Hawaiʻi. Kim Coco owns Affordable Quality Apartment Rentals (AQuA), LLC — 50% of her apartments provide housing to low-income or previously-homeless families. Kim Coco has been a certified therapeutic foster mom to teenagers, many of whom had previously experienced homelessness.